The announcement today of anarchist activity by the Occupy Portland “PDX BIKESWARM” reminded me of today’s importance to Occupy History. The “swarm” claims this day as their birth. That’s almost true. More on that later. It is the day that Mayor Sam Adams staged the police showdown with Occupiers and then, when Zero Hour came, sat back, ate a ham sandwich and watched from a nearby office building. 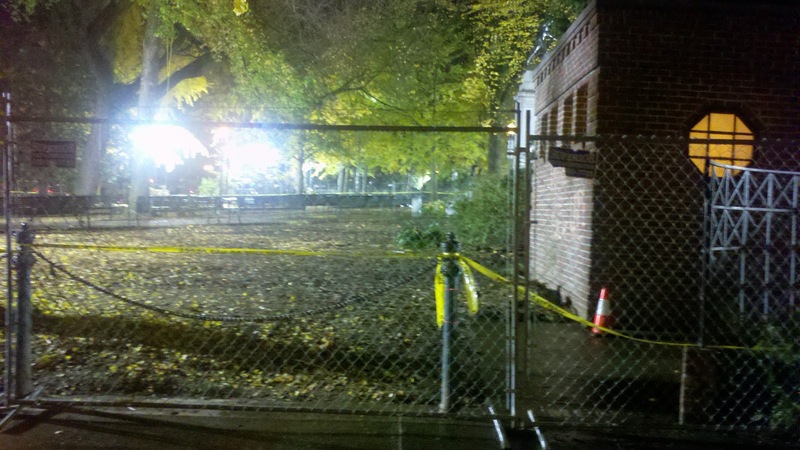 Adams announced that Occupy would be chased from the parks by midnight November 13, 2011. In so doing he begged for a show down. A showdown is what he got. Occupy marauders spent their days before the final showdown building fortresses to overwhelm the police. They nested in trees to lob rocks and sticks and who knows what else from above. The Occupy crowd had several days to call in for reinforcements. They called their brethren from Seattle and Oakland. 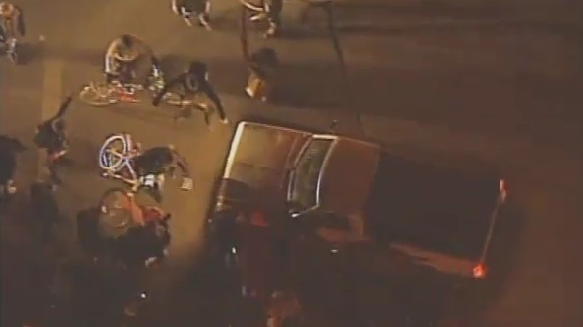 Young 20 somethings from Seattle came spoiling for a fight–and to score some drugs. I know because I talked to a guy as high as a predator drone from Seattle who came to do a little monkey wrenching on behalf of the Anarchists and Black Bloc. Anarchists from the south brought molotov cocktails, spoiling for a fight. “Pinky,” the mentally ill man who spins around and around in a circle on Portland streets, came for the show and the place became a surreal drama played out in the streets in a Mardi Gras atmosphere. The only thing missing were beads. Thousands of onlookers came for the spectacle. They were not disappointed in Sam’s show. Unionistas rode their charges hard in hopes that the onlookers would fall for the act. Then, at around midnight, a series of bicyclists rode around the blocks and that’s when the anarchist bike riders believe their Bike Swarm was born. 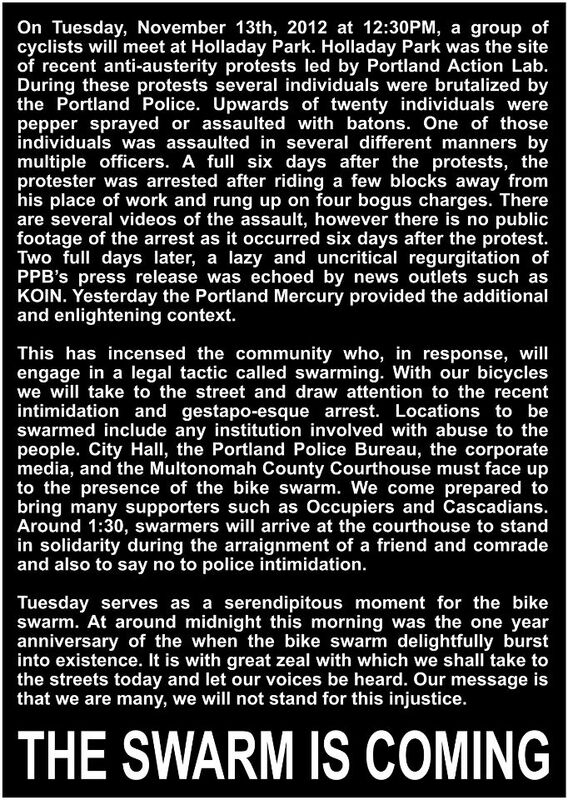 I remember wondering as I looked at my texts from Occupy Portland, huh, I wonder what a bike swarm is? It’s nothing more than the critical mass idiots. In case you hadn’t noticed, Occupy Portland/Seattle/Oakland/DC/NYC is a recycled movement made up of the same people from the far left. I don’t miss them. At all. See posts here, here and here.